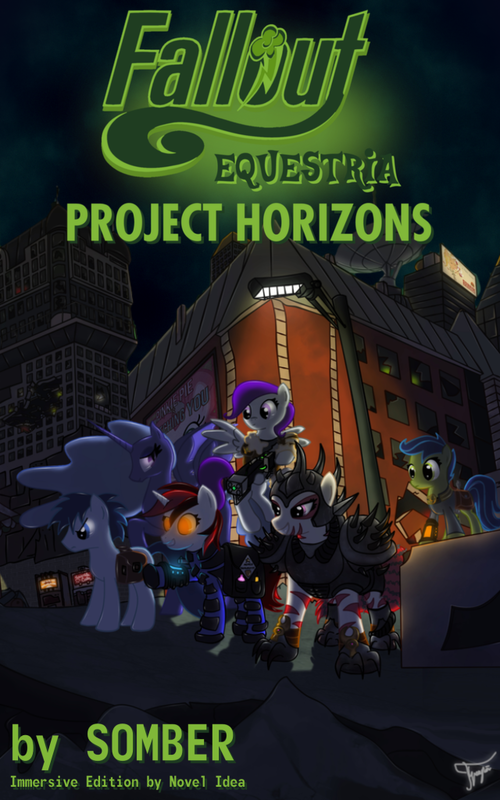 Special Announcement: Completed & Reformatted Fallout: Equestria Project Horizons eBook Now Available! What is this madness? A Manehattan Project post on a SATURDAY?! Has the world gone nuts?! It’s a sign o’ the apocalypse, I tells ya. Run fer ya life! Or you could stick around for something fun. So, as a little side project that I may have mentioned in Thursday’s post, I decided a while back to create a full eBook version of Fallout: Equestria Project Horizons for my own use. I couldn’t read it in Google Docs due to the same injury which ended up resulting in me listening to Fallout: Equestria in the first place (and starting all this madness). Well, back then, the book was only complete to Chapter 73 or 74. I don’t remember quite which one. Well, I realized that no one had ever done a complete version of the ebook and decided that needed to be rectified. So I’m happy to present (with Somber’s blessing, I might add), Fallout: Equestria Project Horizons (Immersive Edition). Yeah, I know, I have a thing for creating special editions of Fallout books. Sush. But this one’s special. Because a lot of fine tuning went into this (yup, the adage, “Do it right, do it with style” is still in effect). For better story flow, all author and editor notes have been moved to their own section under Appendices. Links to YouTube songs have been verified and cleaned and should operate effectively. Minor edits were also made to the formatting of the chapter quotes, footnotes and content warnings for consistency. Content warnings are now verified links that will skip the relevant section to the next “safe” point. Most section, memory orb and other styles of intra-chapter breaks have been cleaned and fixed to allow for a consistent reading experience. Note: This may add additional spacing in places depending on your reading device. New vertical cover design. Original Cover Art by Sw1tchbl4de, Fallout: Equestria Project Horizons Logo by ArtisticMink. Modified and adapted by Novel Idea. Please note that this is not a spelling, grammar or content edit. This is a format edit only. There also may be a few odd intra-chapter breaks that got missed. I literally skimmed the entire book to do this. It took a lot of work, including actually digging into the XML that eBooks are built from (Scrivener was awesome for the compilation, but it couldn’t do links or the fine-tuning I wanted). Yeah, I had to get that specific, especially to get the consistent intra-chapter breaks. Okay folks, enough yappin’. You want a giant 1.5 million word monster of a book? You got it! Until next Thursday, have fun and stay safe out there! Addition: A few folks have requested a PDF version of the file. Not sure why, because the ePub is a lot smaller and easier to work with. I used a simple online conversion program to do it and I’ve noticed there’s a few errors, but the links for the Table of Contents and the Content Warnings work. If you want that version, you can find it here.